The best way to guarantee that your produce is organic and environmentally sound is by starting your own aquaponics system. Most regular consumers of aquaponics produce agree that it tastes better than traditional produce AND it is minutes fresh. Common fruit bearing vegetables like tomatoes, cucumbers, peppers, squash, okra, and even corn can be grown into an aquaponics system. The leafy greens like lettuce, cabbage, etc grows very well in an aquaponics garden. In fact herbs like basil also grows well, including legumes like beans, peas, etc. Flowers too! For root vegetables like potatoes, onions, garlic, beetroot, carrots you may want to consider a Dutch bucket system that mhpgardener demonstrates with tomatoes below using perlite (least expensive grow media) in a paint strainer bag that allows the roots to grow without resistance. Our modification would be to use our aquarium water in the drip system. The following information won't be about 'how-to-grow', rather the emphasis is on 'why-to-grow' and 'what to grow', in that many of the D-I-Y videos displayed the crops grown. Some of the crops and livestock as well is grown to complete/expand the ecological system. Aquaponics * Eva Roufe * 3:57 mins. Our food crisis is coming to light as more of us realize what is happening to the food grown by monopolies. Regardless to this chaos, there are solutions and one of them is aquaponic farming. Note: Sharp young girl! Good message. School assignment? This video was listed in the Overview topic. Its inclusion here is a reminder that there are crops and livestock considerations beyond the obvious within an eco system. Starting Hydroponic BasilSeeds * greenerways2012 * 7:25 mins. Convert to AQ system. Good tips. Note: Inexpensive grow light, CFL 6500 daylight. Yellow leaves the Aquaponic WORLD!!! with Seeds Starting * 3 mins. 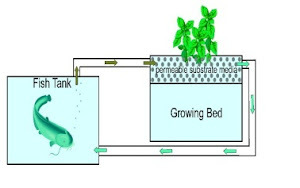 I show you how to start your very own aquaponics seeds. I use some tissue paper to wick up the water. This is cheap and an easy method to do yourself no need for rock wool. No need for transplanting from dirt to aquaponics. Secondly, I show some signs of iron deficiency in my plants and how to correct them. You can use chelated iron, I used iron sulfate which is safe for fish and plants. No worries. What grows best? The best plants for vertical farming ... * 2:36 mins. In this video, Bright Agrotech's Co-Founder, Nate Storey, discusses the best crops to plant when starting vertical farming or gardening either with aquaponics or hydroponics. Mini Aquaponic NOV 2012 * Carrots in Grow Bed * d0mine11 * 2:59 mins. Plant one seed harvest two carrots * khthhonl * 1:00 min. "Carrot is not an easy plant to grow from seed. Here I will show you how to get 2 or more carrots from one seed. It is extending your carrot crop by not eating the whole carrot. Cut 1 cm of the top to replant. One seed will give you many carrots." Note: This can be done with onions as well! Thinking of compost as a crop may help keep its maintenance on a schedule instead of the last thing to do - if I have time. Composting * with chickens * HomesteadBlessings * 5:45 mins. 24-7 Compost Tea * mhpgardener * 7:37 mins. How to make a Worm Composting Bin * BigTexWorms * 8:28 mins. Growing duckweed in my backyard. Rabbit, Duck and Chicken food production * 2:44 mins. Growing duckweed in a semi-shady location. I'm hoping to get a decent yield and be able to supplement my animals feed with it. Sustainable Firewood on 1 acre * Note: An article that goes with the following video. A Wood Shed Hoop House! * Why not? * 17:44 mins. Fodder Feeding - Our family farm path to organic. * 22:01 mins. "Every excruciating detail, but I want you to see that it took me 22 minutes. When people complain about all the fuss, I want you to see it as 20 minutes, twice a day. We were using locally milled animal feed for our 25 chickens and 2 calves, and feed costs were killing us. We did not want to go to even cheaper feed, we wanted to go organic. My calves and chickens are healthy and happy, and my feed bill saw such a drastic cut that I have switched to organic grains and still save money!" Note: amommamust has a number of videos on homesteading worth checking out; especially her tilapia videos. Barley Fodder Grow Room Procedures * 15:31 mins. "At Paca Pride Guest Ranch, we're feeding our herd fresh micro-greens every day over the winter! We produce 50lbs of fresh barley fodder daily in a space that's 4'D x 7'W x 6'H." H2O Farm on BBC's Countryfile * 4:46 mins. Note: The same methods used here could be done with an auqaponics system; that way you would not need to throw away the questionable water every 2 to 3 weeks. Growing Microgreens Indoors * In soil * veseysseeds * 9:33 mins. Veseys website Grow Microgreens indoors all year! This popular mix of tender salad greens is easy to grow. How to Make Your Own Pure Stevia and Liquid Stevia * 9:23 mins. Indoor Aquaponics Garden - Free Food! * 1:47 mins. This indoor aquaponics garden is growing watercress, lettuce, parsley and lemon balm all with the waste of just TWO gold fish! The plants in the hydroponic grow bed, which is filled with hydroton and lava rock, filter the water before it returns to the fish in the reservoir. Dawn provides a list of benefits/reasons to have your own garden and includes a cost comparison chart.